Heat the oil over high heat in a deep pot, then add lemongrass, shallots, garlic, chilies and kaffir lime leaves, sautéing until fragrant and soft. Next goes in the coconut milk, stock, fish sauce, pepper and sugar. Turn the heat to medium and bring to a simmer. Add the mussels and cover the pot tightly, until mussels have opened, which means it is cooked. This will take about 4 minutes. Adjust seasoning of fish sauce and pepper if needed. 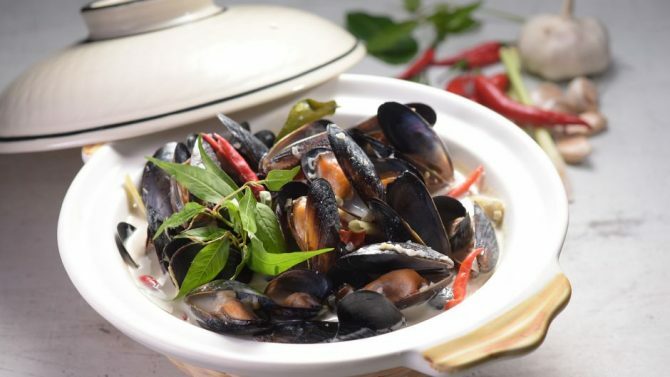 Ladle out the mussels with the broth into a serving dish. Garnish with spigs of cilantro and Vietnamese mint.